Argon–argon (or 40Ar/39Ar) dating is a radiometric dating method invented to supersede potassium-argon (K/Ar) dating in accuracy. The older method required splitting samples into two for separate potassium and argon measurements, while the newer method requires only one rock fragment or mineral grain and uses a single measurement of argon isotopes. 40Ar/39Ar dating relies on neutron irradiation from a nuclear reactor to convert a stable form of potassium (39 K) into the radioactive 39 Ar. As long as a standard of known age is co-irradiated with unknown samples, it is possible to use a single measurement of argon isotopes to calculate the 40K/40Ar* ratio, and thus to calculate the age of the unknown sample. 40Ar* refers to the radiogenic 40Ar, i.e. the 40Ar produced from radioactive decay of 40K. 40Ar* does not include atmospheric argon adsorbed to the surface or inherited through diffusion and its calculated value is derived from measuring the 36Ar (which is assumed to be of atmospheric origin) and assuming that 40Ar is found in a constant ratio to 36Ar in atmospheric gases. Argon is a chemical element with symbol Ar and atomic number 18. It is in group 18 of the periodic table and is a noble gas. Argon is the third-most abundant gas in the Earth's atmosphere, at 0.934%. It is more than twice as abundant as water vapor, 23 times as abundant as carbon dioxide, and more than 500 times as abundant as neon. Argon is the most abundant noble gas in Earth's crust, comprising 0.00015% of the crust. 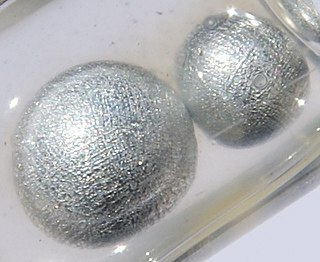 Radiometric dating, radioactive dating or radioisotope dating is a technique used to date materials such as rocks or carbon, in which trace radioactive impurities were selectively incorporated when they were formed. The method compares the abundance of a naturally occurring radioactive isotope within the material to the abundance of its decay products, which form at a known constant rate of decay. 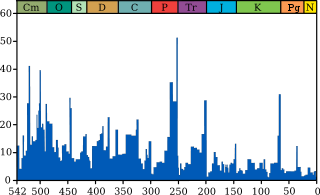 The use of radiometric dating was first published in 1907 by Bertram Boltwood and is now the principal source of information about the absolute age of rocks and other geological features, including the age of fossilized life forms or the age of the Earth itself, and can also be used to date a wide range of natural and man-made materials. The sample is generally crushed and single crystals of a mineral or fragments of rock hand-selected for analysis. These are then irradiated to produce 39Ar from 39K. The sample is then degassed in a high-vacuum mass spectrometer via a laser or resistance furnace. Heating causes the crystal structure of the mineral (or minerals) to degrade, and, as the sample melts, trapped gases are released. The gas may include atmospheric gases, such as carbon dioxide, water, nitrogen, and argon, and radiogenic gases, like argon and helium, generated from regular radioactive decay over geologic time. The abundance of 40Ar* increases with the age of the sample, though the rate of increase decays exponentially with the half-life of 40K, which is 1.248 billion years. where λ is the radioactive decay constant of 40K (approximately 5.5 x 10−10 year−1, corresponding to a half-life of approximately 1.25 billion years), J is the J-factor (parameter associated with the irradiation process), and R is the 40Ar*/39Ar ratio. The J factor relates to the fluence of the neutron bombardment during the irradiation process; a denser flow of neutron particles will convert more atoms of 39K to 39Ar than a less dense one. Orbital tuning refers to the process of adjusting the time scale of a geologic or climate record so that the observed fluctuations correspond to the Milankovitch cycles in the Earth's orbital motion. 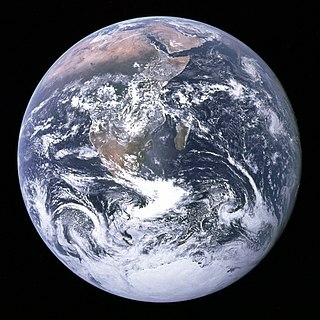 Because changes in the Earth's orbit affect the amount and distribution of sunlight the Earth receives, such changes are expected to introduce periodic climate changes on time scales of 20-100 kyr. Long records of sedimentation or climate should record such variations; however, such records often have poorly constrained age scales. As a result, scientists will sometimes adjust the timing of the features in their records to match the predictions of orbital theory in the hopes of improving the dating accuracy. However, "overtuning" can result in apparent features that have no basis in the real data, such as occurred with the original SPECMAP record. The primary use for 40Ar/39Ar geochronology is dating metamorphic and igneous minerals. 40Ar/39Ar is unlikely to provide the age of intrusions of granite as the age typically reflects the time when a mineral cooled through its closure temperature. However, in a metamorphic rock that has not exceeded its closure temperature the age likely dates the crystallization of the mineral. Dating of movement on fault systems is also possible with the 40Ar/39Ar method. Different minerals have different closure temperatures; biotite is ~300°C, muscovite is about 400°C and hornblende has a closure temperature of ~550°C. Thus, a granite containing all three minerals will record three different "ages" of emplacement as it cools down through these closure temperatures. Thus, although a crystallization age is not recorded, the information is still useful in constructing the thermal history of the rock. In radiometric dating, closure temperature or blocking temperature refers to the temperature of a system, such as a mineral, at the time given by its radiometric date. In physical terms, the closure temperature is the temperature at which a system has cooled so that there is no longer any significant diffusion of the parent or daughter isotopes out of the system and into the external environment. The concept's initial mathematical formulation was presented in a seminal paper by Martin H. Dodson, "Closure temperature in cooling geochronological and petrological systems" in the journal Contributions to Mineralogy and Petrology, 1973, with refinements to a usable experimental formulation by other scientists in later years. This temperature varies broadly among different minerals and also differs depending on the parent and daughter atoms being considered. It is specific to a particular material and isotopic system. 2. More generally, it refers to the dark mica series, primarily a solid-solution series between the iron-endmember annite, and the magnesium-endmember phlogopite; more aluminous end-members include siderophyllite. 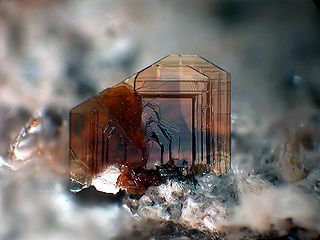 Biotite was named by J.F.L. Hausmann in 1847 in honor of the French physicist Jean-Baptiste Biot, who performed early research into the many optical properties of mica. Dating minerals may provide age information on a rock, but assumptions must be made. Minerals usually only record the last time they cooled down below the closure temperature, and this may not represent all of the events which the rock has undergone, and may not match the age of intrusion. Thus, discretion and interpretation of age dating is essential. 40Ar/39Ar geochronology assumes that a rock retains all of its 40Ar after cooling past the closing temperature and that this was properly sampled during analysis. This technique allows the errors involved in K-Ar dating to be checked. Argon–argon dating has the advantage of not requiring determinations of potassium. Modern methods of analysis allow individual regions of crystals to be investigated. This method is important as it allows crystals forming and cooling during different events to be identified. One problem with argon-argon dating has been a slight discrepancy with other methods of dating. Recent work by Kuiper  (see also Kerr  ) reports that a correction of 0.65% is needed. 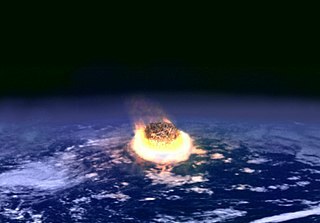 Thus the Cretaceous–Paleogene extinction (when the dinosaurs died out) - previously dated at 65.0 or 65.5 million years ago - is more accurately dated to 66.0 Ma. Similarly, the Permian-Triassic extinction is now dated at 252.5 Ma, which is effectively coincident with the age determined by other means for Siberian Traps basalt flows. The Siberian Traps is a large region of volcanic rock, known as a large igneous province, in Siberia, Russia. The massive eruptive event that formed the traps is one of the largest-known volcanic events in the last 500 million years. Neutron activation analysis (NAA) is the nuclear process used for determining the concentrations of elements in a vast amount of materials. NAA allows discrete sampling of elements as it disregards the chemical form of a sample, and focuses solely on its nucleus. The method is based on neutron activation and therefore requires a source of neutrons. The sample is bombarded with neutrons, causing the elements to form radioactive isotopes. The radioactive emissions and radioactive decay paths for each element are well known. Using this information, it is possible to study spectra of the emissions of the radioactive sample, and determine the concentrations of the elements within it. A particular advantage of this technique is that it does not destroy the sample, and thus has been used for analysis of works of art and historical artifacts. NAA can also be used to determine the activity of a radioactive sample. Argon (18Ar) has 25 known isotopes, from 30Ar to 54Ar and 1 isomer (32mAr), of which three are stable. On the Earth, 40Ar makes up 99.6% of natural argon. The longest-lived radioactive isotopes are 39Ar with a half-life of 269 years, 42Ar with a half-life of 32.9 years, and 37Ar with a half-life of 35.04 days. All other isotopes have half-lives of less than two hours, and most less than one minute. The least stable is 30Ar with a half-life shorter than 20 nanoseconds. Potassium-40 (40K) is a radioactive isotope of potassium which has a very long half-life of 1.251×109 years. It makes up 0.012% of the total amount of potassium found in nature. Thermochronology is the study of the thermal evolution of a region of a planet. Thermochronologists use radiometric dating along with the closure temperatures that represent the temperature of the mineral being studied at the time given by the date recorded, to understand the thermal history of a specific rock, mineral, or geologic unit. It is a subfield within geology, and is closely associated with geochronology. Surface exposure dating is a collection of geochronological techniques for estimating the length of time that a rock has been exposed at or near Earth's surface. Surface exposure dating is used to date glacial advances and retreats, erosion history, lava flows, meteorite impacts, rock slides, fault scarps, cave development, and other geological events. It is most useful for rocks which have been exposed for between 10 years and 30,000,000 years. Monazite geochronology is a dating technique to study geological history using the mineral monazite. It is a powerful tool in studying the complex history of metamorphic rocks particularly, as well as igneous, sedimentary and hydrothermal rocks. The dating uses the radioactive processes in monazite as a clock. Potassium–calcium dating, abbreviated K–Ca dating, is a radiometric dating method used in geochronology. It is based upon measuring the ratio of a parent isotope of potassium (40K) to a daughter isotope of calcium (40Ca). This form of radioactive decay is accomplished through beta decay. Optically stimulated luminescence (OSL) thermochronometry is a dating method used to determine the time since quartz and/or feldspar began to store charge as it cools through the effective closure temperature. The closure temperature for quartz and Na-rich K-feldspar is 30-35oC and 25oC respectively. When quartz and feldspar are beneath the earth, they are hot. They cool when any geological process e.g. focused erosion causes their exhumation to the earth surface. As they cool, they trap electron charges originating from within the crystal lattice. These charges are accommodated within crystallographic defects or vacancies in their crystal lattices as the mineral cools below the closure temperature. UC Berkeley press release: "Precise dating of the destruction of Pompeii proves argon-argon method can reliably date rocks as young as 2,000 years"